Ah salmon, I love you!! This freshwater fish is beautiful, vibrant and colourful and is known for its high protein and amino acid content. It is relatively cheap to buy, versatile, so scrumptious and good for you. It is silky, delicate and creamy in flavour and brightens up any dish visually and tastefully. 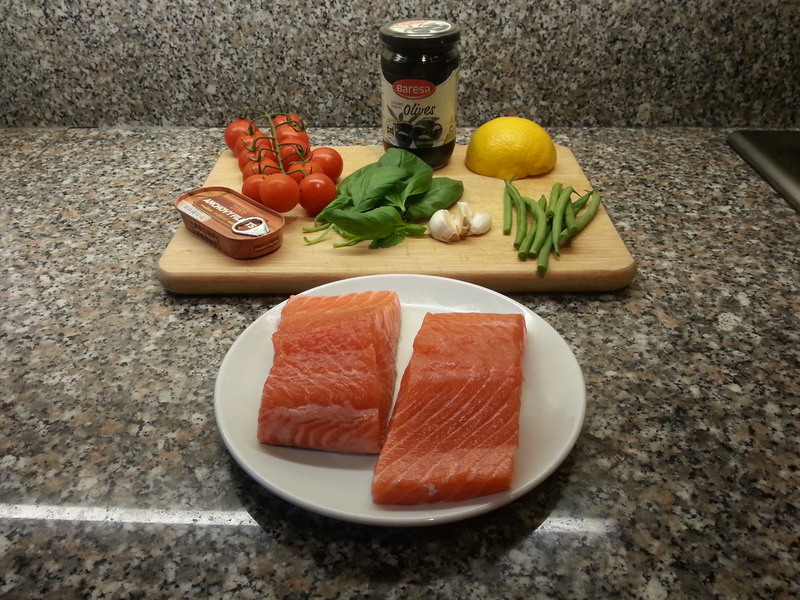 This salmon recipe is an old Jamie Oliver classic. 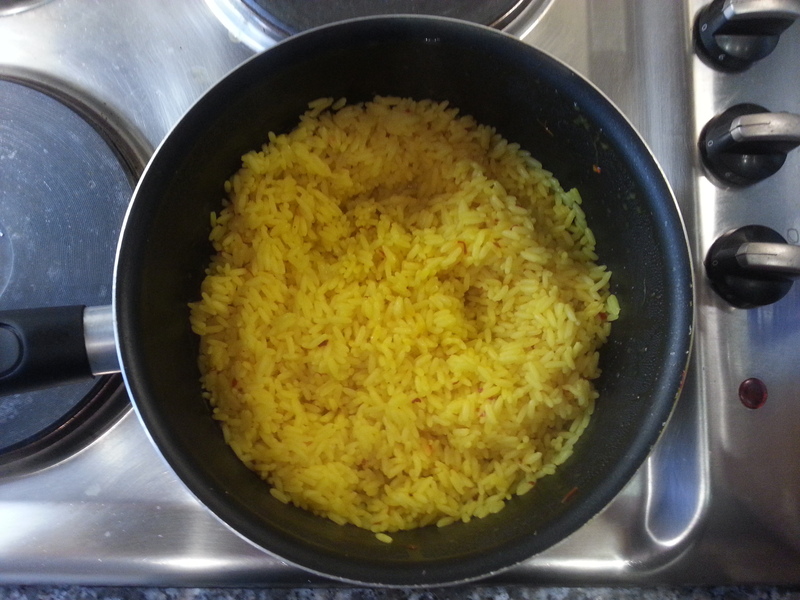 It is a simple, tasty dish and I like to serve it with my oily basil aïoli and spicy saffron rice. Yes, yes, I know… saffron is a spice that is currently more expensive than gold but it is worth the purchase! The bitter, honey-like taste of the saffron and the heat of the dried chillies in the rice really compliment this delicious, oily fish! The lemon juice and basil in my aïoli is a wonderful accompaniment. 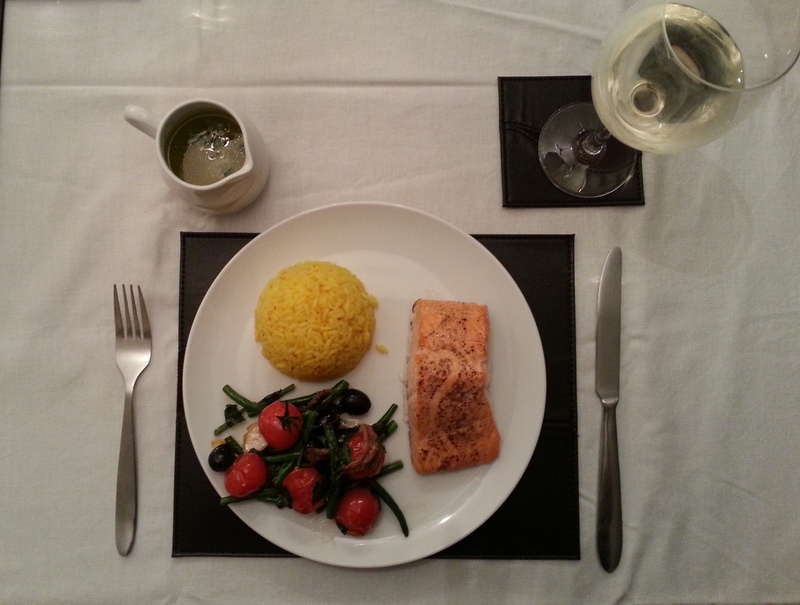 It adds a wonderful flavour and richness when drizzled over the cooked salmon. I personally insist on paying a little extra for organic salmon rather than skimp on regular farmed. Not only does it taste so much better and the flavour is so much bigger but even visually, it is gorgeous. The colour is bright orange/red and when you compare it to its paler and regular, farmed counterpart; you can really see there is no comparison. This is such a simple dish to make and so full of flavour! Enjoy. First make your aïoli. Mash up your garlic with 1 teaspoon of salt in a pestle and mortar or alternatively, you can just finely chop the garlic. 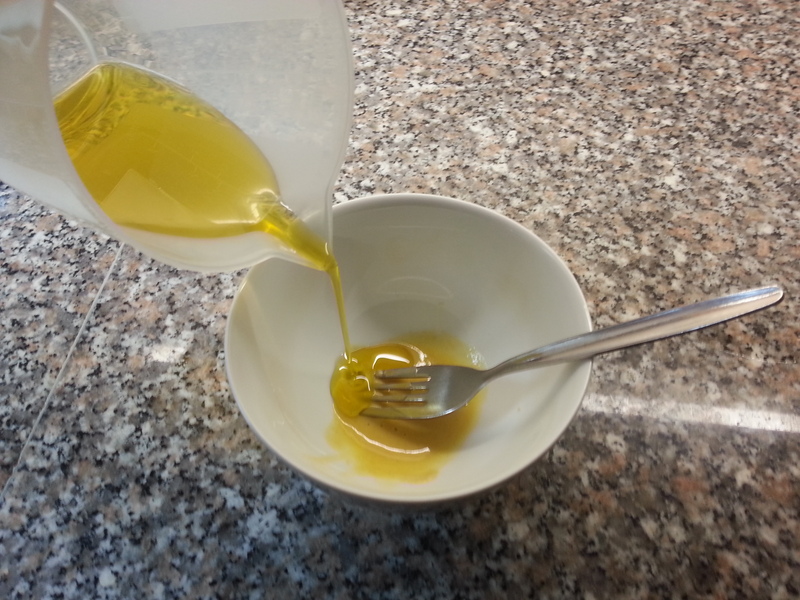 Put the egg yolk and mustard into a bowl and whisk, and then start to add your olive oil. Be sure to add this a little at a time while whisking. 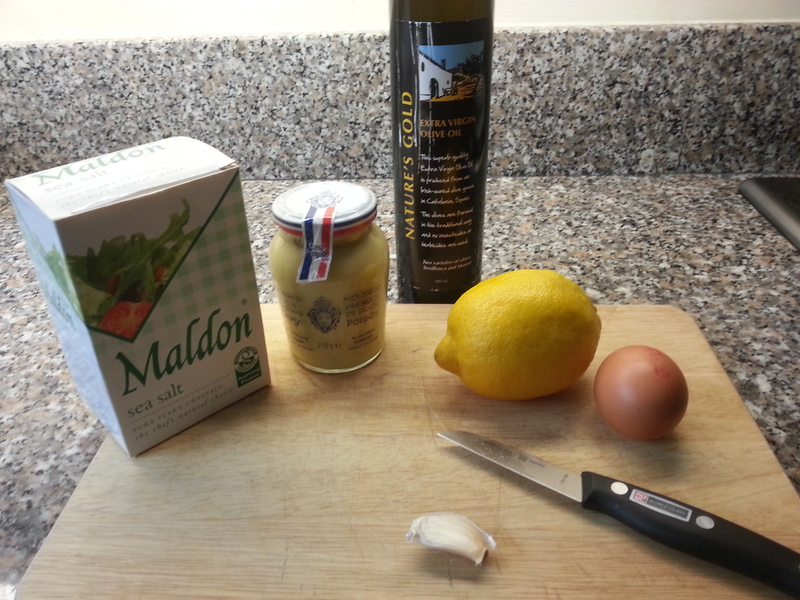 Once all the oil has been mixed in, add your garlic and lemon. Be sure to taste and see how much lemon you wish to add. 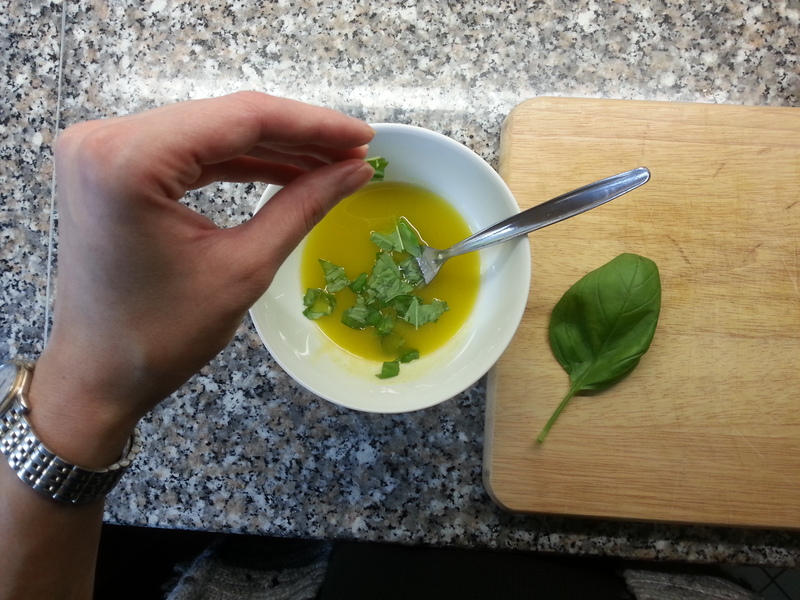 Then tear the basil leaves and add them to the mixture. Season with salt and pepper. Transfer to a pouring jug. You may have a lot of aioli for 2 people (this quantity serves 4) so you can cover it, put it as a leftover in the fridge and use it for another meal. This should last 2-3 days once refrigerated. Now make your spicy saffron rice! 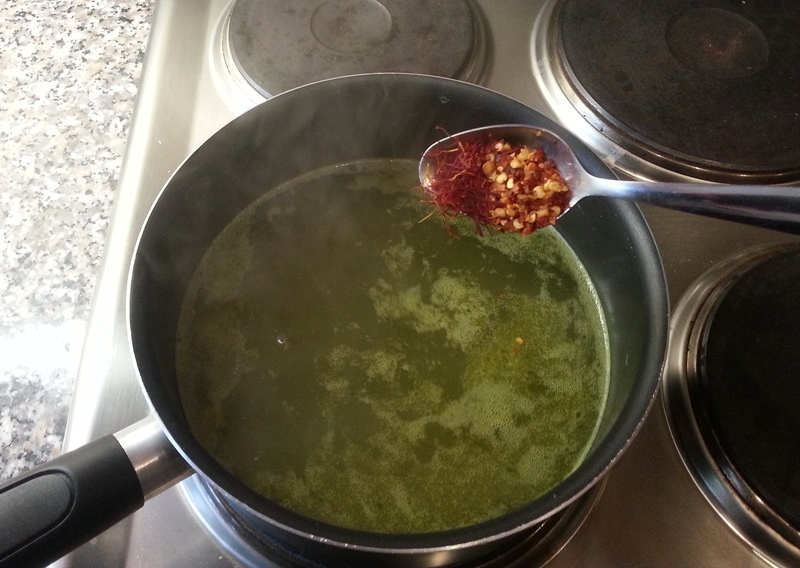 Pour your stock into a medium sized pot and place the pot over a hob on a high heat. 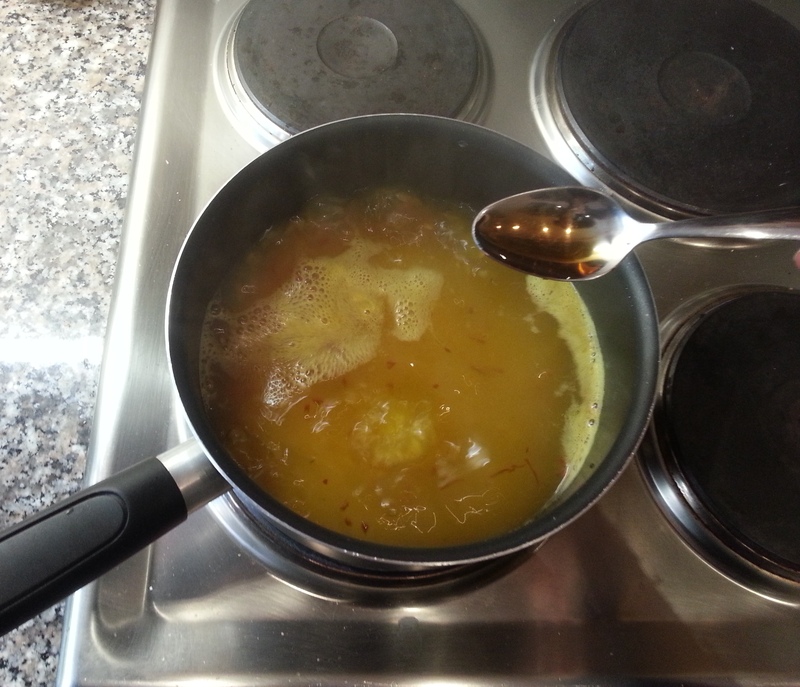 As the stock is being brought to the boil, add the saffron, chilli and lemon juice. Stir well and then add the rice with the fish sauce and bring to the boil. Once boiling, reduce the heat to a low temperature and cover. Cook for about 15 minutes or until all the liquid has been absorbed by the rice. When most of the liquid has gone, turn off the heat and keep the lid on. The remaining liquid will be absorbed by the rice. This can be made ahead of time and reheated when you are ready to eat. 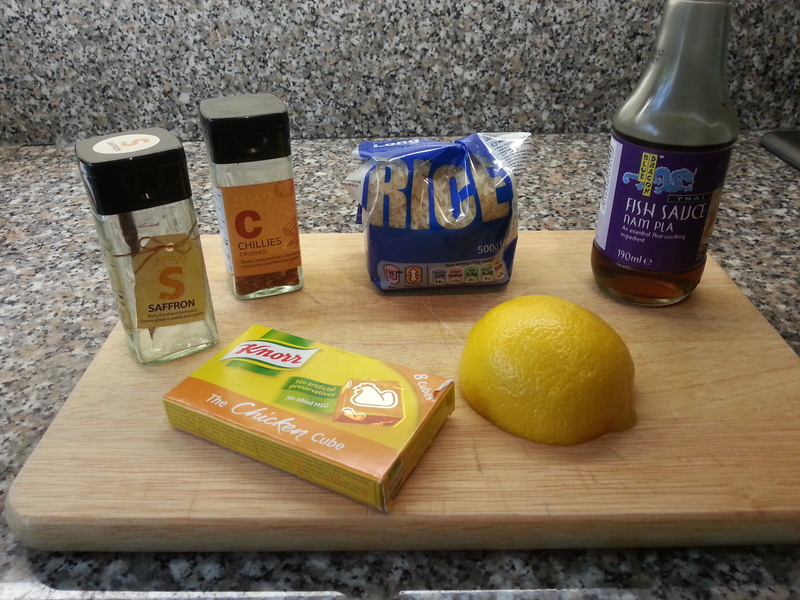 Taste-test the rice before serving and stir in a few splashes fish sauce if you think the rice needs more flavour. (Careful not to add too much as fish sauce is very salty). Finally; the salmon! Preheat the oven to a high temperature, about 220°c. First, tail the green beans if needed (basically, chop a little off each end) and then blanch them in salted, boiling water and drain. Smash the whole, unpeeled garlic cloves under a large knife and leave the skin on. 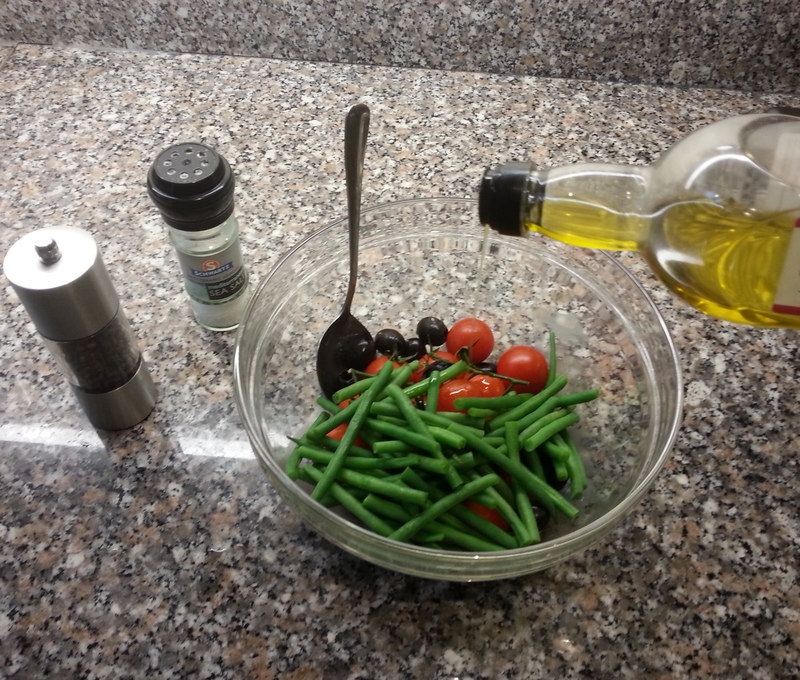 Put them in a bowl with the olives, cherry tomatoes and toss them in the olive oil. Add the torn basil leaves and season with salt and pepper. 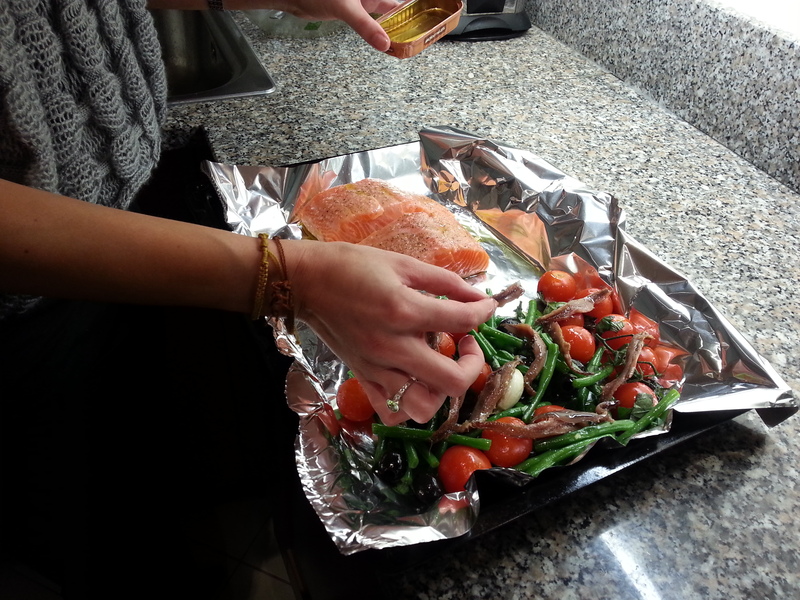 Quickly wash the salmon under the tap and pat dry with a paper towel. Squeeze the juice of half a lemon over both sides of the fillets and also season with salt and pepper on both sides. Drizzle a little olive oil over the top. 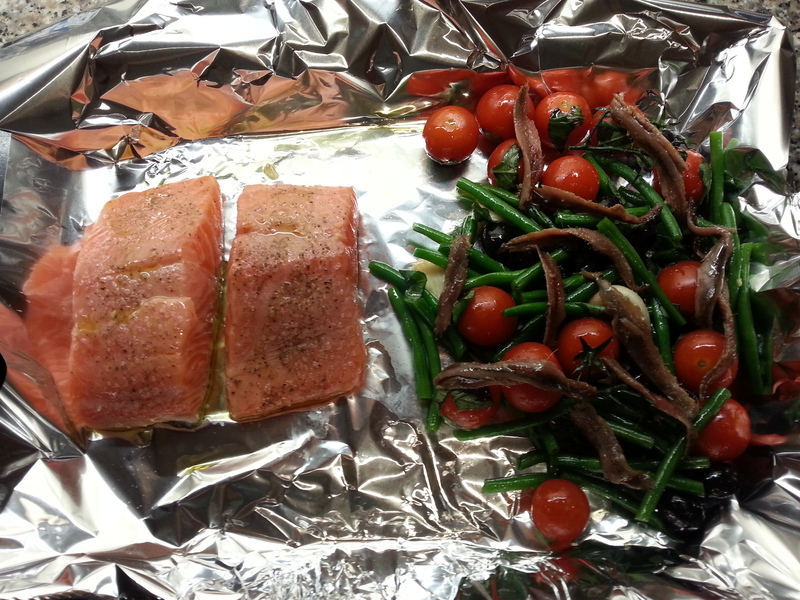 On a baking tray, place the salmon fillets at one end and the green bean mix on the other end of the tray. Lay the anchovies of this mixture. Roast in the preheated oven for 10 minutes, then remove and put on a plate. Serve this with the homemade chilli saffron rice and the oily basil aïoli. Drizzle this over the salmon to your liking. You can also serve the salmon with an optional lemon wedge. Enjoy with a yummy glass Riesling or Merlot!